As the meeting point between Europe, colonial America, and Africa, the history of the Atlantic world is a constantly shifting arena, but one which has been a focus of huge and vibrant debate for many years. In over thirty chapters, all written by experts in the field, The Atlantic World takes up these debates and gathers together key, original scholarship to provide an authoritative survey of this increasingly popular area of world history. The book takes a thematic approach to topics including exploration, migration and cultural encounters. In the first chapters, scholars examine the interactions between groups which converged in the Atlantic world, such as slaves, European migrants and Native Americans. The volume then considers questions such as finance, money and commerce in the Atlantic world, as well as warfare, government and religion. The collection closes with chapters examining how ideas circulated across and around the Atlantic and beyond. It presents the Atlantic as a shared space in which commodities and ideas were exchanged and traded, and examines the impact that these exchanges had on both people and places. Including an introductory essay from the editors which defines the field, and lavishly illustrated with paintings, drawings and maps this accessible volume is invaluable reading for all students and scholars of this broad sweep of world history. D'Maris Coffman is a Leverhulme Trust Early Career Fellow and Director of the Centre for Financial History at Newnham College, University of Cambridge, Adrian Leonard is a post-doctoral researcher at the Centre for Financial History at Newnham College, University of Cambridge and William O'Reilly is lecturer in early modern History at the University of Cambridge. "One of the most comprehensive set of essays on the Atlantic World the field has seen to date, this volume assembles an impressive lineup of international and interdisciplinary scholars to shed genuinely new light on old topics and to encourage an enlarged sense of the Atlantic World’s reach. With innovative chapters on animals and the ecology, the Pacific, southern Africa, political economy, finance, and religion (in addition to many more rich topics) this volume showcases the next generation of Atlantic World research and gets us closer to the "Atlantic and the World" inclusivity some scholars have called for." "The virtue of this volume is the ambitiousness of its approach and the diversity of its chapters, both geographically and thematically. A worthy edition to any Atlanticist’s already groaning bookshelf!" 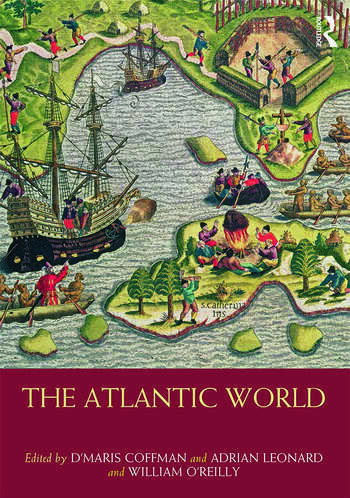 "Editors Coffman, Leonard, and O’Reilly provide an extensive, captivating, and valuable overview of the Atlantic World. The large areas of coverage and thematic organization allow the book to be employed in a variety of undergraduate courses as a required text capable of generating discussion and research questions. Summing Up: Recommended."